Just a few more thoughts and ideas from our favorite new teaser trailer! Apologies as always for the length, rambles and walls of text... I hope you enjoy anyway, and find a few new ideas to consider. First off, I was sort of knocked out to realize that the officially shared mural is actually CROPPED. So the mural I was doing all my initial hysterical analysis on... was cropped. 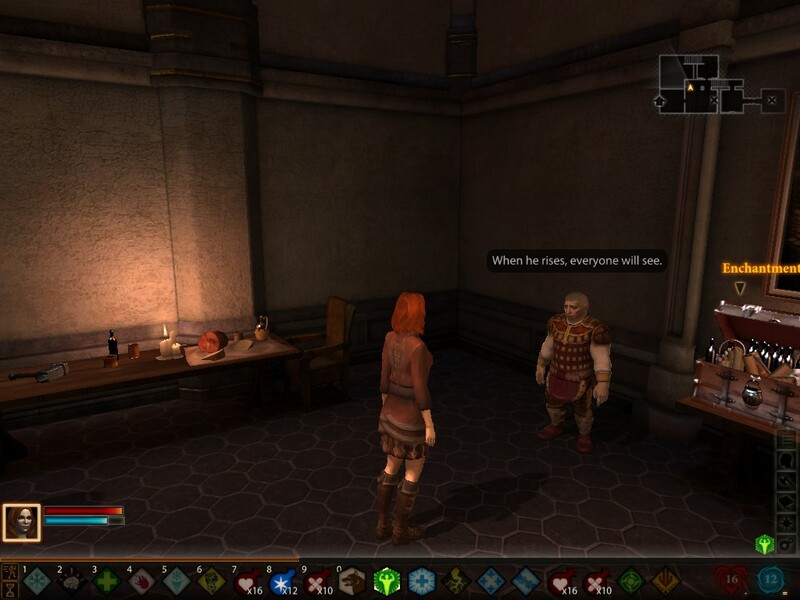 Sneaky BioWare! There are actually three different versions out there. 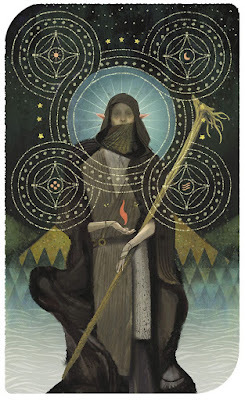 The figure I believe to be Solas is standing on an arched road, or what I believe to be a bridge. A burning bridge, to be exact (gotta love those sneaky metaphors), whose flames are burnished with bright gold. Not only do we see the full tree behind him, but it is visibly burned, and there is something winding up the center of the trunk in a diagonal fashion. This makes me fairly certain the tree is a vhenadahl, one of the trees sacred to Elves, and which is frequently painted or decorated to celebrate the elves. 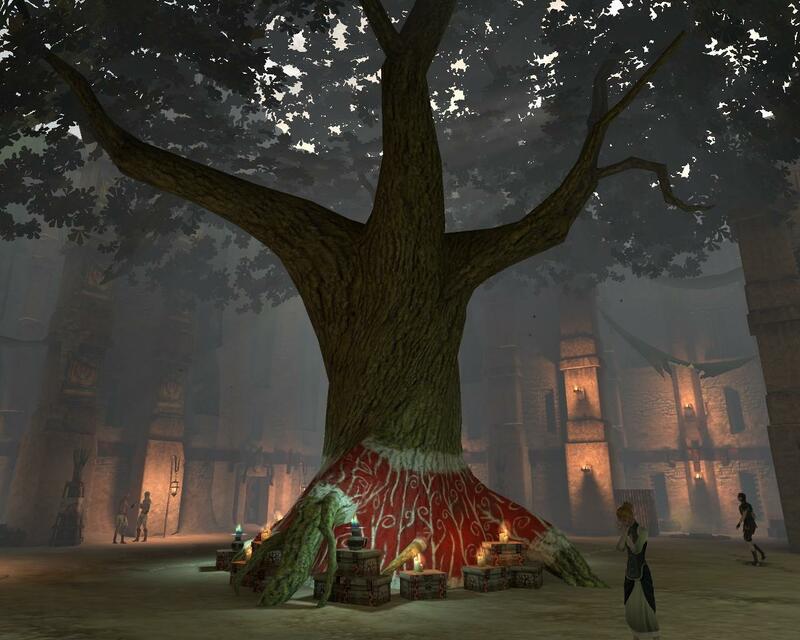 So it is with the vhenadahl, the tree of the people. Every alienage has one, I'm told. Or they used to. When I was a little girl, my mother told me the tree was a symbol of Arlathan, but not even she knew more. For extra echoes and gravitas, it's worth noting that, further, "Burn the Vhenadahl" is an actual quest in the Dragon Age:Origins DLC, "The Darkspawn Chronicles." And now here we are looking at an actual burned vhenadahl—is it a representation of destroyed Arlathan? Is it a representation of something more recent? Did the tree burn in the "raw chaos" of the destruction of the Veil (which we may be seeing now)? Speaking of lore, the ancient elven poem "Where Willows Wail" has some very intriguing elements, and one very important tree reference (please note that I have taken the liberty of smoothing out some of the translation here and that it is of course subjective in nature). It's fun to note that the opening stanza is in iambic tetrameter (or, in a series with four "feet," or unstressed/stressed syllables in a row)—it made me wonder if Patrick Weekes wrote this? Whose withered windings want wassail. Were wavering with wanion ward. When wishing waned, we wighters warred. When wolfen wan, we wastrels warred. We try to lead despite the eventual failing of our markings. To the inevitable and troubling freedom we are committed. When we could no longer believe, we lost glory to war. When the Wolf won, we lost the People to war. It's worth noting this for a few reasons: First off, for the pretty fascinating parallels buried within its lines, as quoted above. I love all the hidden references to waking and dreaming—obviously, I believe, references to the Fade and to uthenera. I think most of the poem is actually spoken from the point of view of one of the ancient elven sentinels, like Abelas, both mourning the past and their own weakness (the "eventual failing of our markings"). The loss of eternity and tree is of course the loss of immortality, and the loss of the People in general (and Arlathan). It's interesting that they, like Solas, view their commitment to freedom as both necessary and troubling. And of course, in the end, they lost it all. 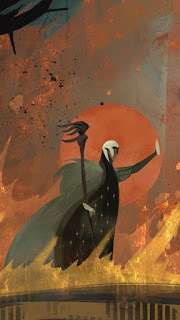 Solas, it might be argued, is the last sentinel elf. And the most vigilant. And now "the land of dreams is no longer [his] journey," which also echoes his final conversation with a romanced Inquisitor, when he tells her he now walks the path of death, the din'anshiral, and he would not have her see what he becomes. I feel like this mural's very title could be "The Din'anshiral." 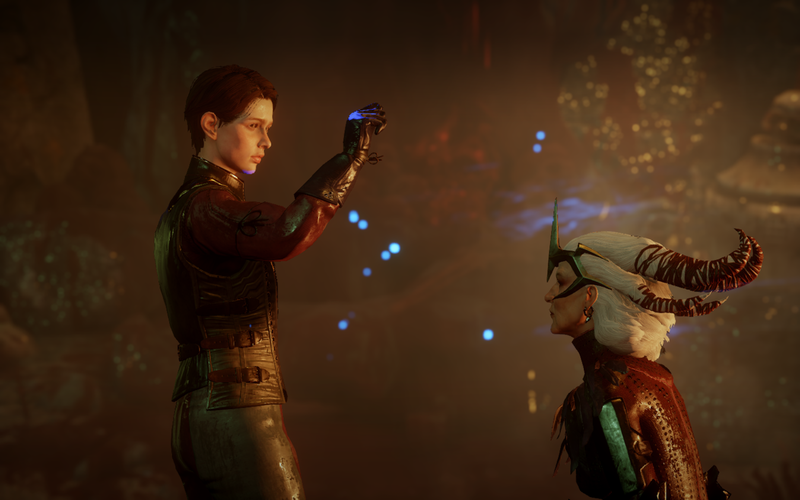 This poem is also important to note, however because it's the poem Sera quotes to a high-friendship or romanced Inquisitor as a bit of nonsense out of her Denerim childhood—nonsense that just happens to be an ancient piece of high elven lore! Now this could just be coincidence, but... I don't think it is. 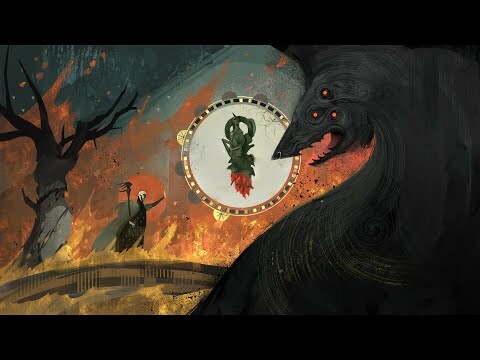 If I add in these elements: Sera's echoing and intriguing connection to Andruil (complete with hidden signs and symbols on her Tarot), her reciting the poem that mourns the loss of Arlathan, and the fact that she is the only character to have red eyes on her Tarot beyond Solas's Dread Wolf, I think this deserves a second look. 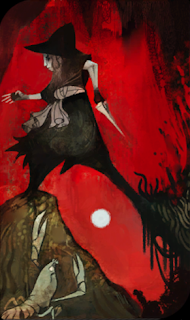 Sera's red eyes in the Tarot. The red eyes of the Dread Wolf. Solas's red eyes here on the new fresco. Do they signify corruption by Red Lyrium? Or a connection to the Fade? Or simply to the divine? I will always think there's something more there, beyond the Sera/Andruil Tarot parallels, and even here, we can see what are arguably elements of all three branches of the Vir Tanadhal: The Way of the Arrow, The Way of the Bow, and The Way of the Forest ("Together we are stronger than the one"—in this case, possibly by the Inquisition symbol itself). 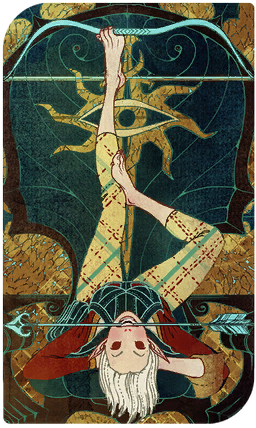 On the flip side, all of this may even imply that Sera is going to be important in defeating Andruil, that she is in fact her antithesis (both cards with heavy Andruil subtext appear to include "flipped" elements—for instance, Andruil's bow is always pointed downward, and here's Sera, mirroring her, but in the absolute reversed position, although it did point down in the previous card (but we'll go over that again another day—I'm prepping a whole series of posts on the secrets of the Tarots). Meanwhile, let's look at the mural again. The skies could be argued as being twilight, or a greenish, misty dark blue. Below those skies, high above Solas and the tree at left, we see the jagged shadowy shapes of what might be mountains (or the jagged walls of the physical Fade). I'm voting that it's mountains because of the little visual trick at the beginning of the teaser, in which the edges of the idol look like mountains as the sun rises over the Frostbacks. I also think these are mountains here because of Solas's secret towers and hideouts in "Trespasser," at least one of which appeared to be hidden in the Vimmarks. Between Solas and the sky, however, echoing the general flow of the tree branches, notice something else? There's a structure there, almost like the gabled roof of a building or temple—a straight and diagonal line, clearly edged and shadowed, that appears to come to a point offscreen above the central circle image of the Lyrium Idol. What is this structure? Is it somewhere we've been before? Is it the Black/Golden City? Arlathan? 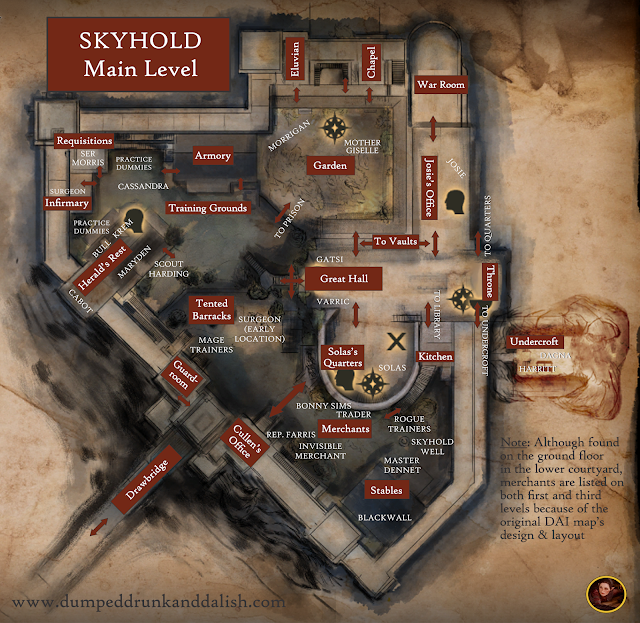 Skyhold? 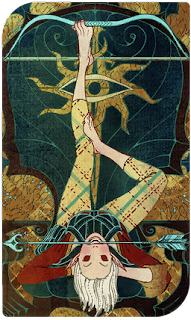 Also, note the striped patterns on the bridge beneath Solas, and look at the romanced Tarot I've posted here farther down: Those same exact patterns appear on the earth behind Solas's feet. Solas is standing in the middle of a burning bridge. Behind him is the burned and destroyed symbol of Arlathan. Before him is the face he never wanted anyone to see—the savage dark face he wore "as a symbol of Pride," given by his enemies, those who enslaved their own people and marked them like animals. And between them both is an image of grief, loss, and agony, of Blight and corruption, encircled by the divine reminder that once he was part of a group of eight, and that six of the seven who remained are sundered forever from him. Even superficially, it's brilliant symbolism: a beautiful, subtle, terribly tragic grace note. As the video of the idol transforms to the fresco, some really interesting and subtle things begin to happen. The ending fresco image is not the same one we see in the flat fresco. Look at the screen shot I've taken below from the teaser. The central idol remains the "real" one, not the painted version. And there are subtle, smoky lines of power, Blight or corruption emanating from Solas, his staff, and from the Dread Wolf. The Dread Wolf, meanwhile, is markedly different from the flat fresco version—no circles or swirls, and it's subtle shimmering, transparent, smoky like the lines of power. We can actually see some of those lines through the wolf's face (it's much more transparent here than in the original fresco, which only has slight elements of it). Is this yet another clue that the Wolf is emblightened, exuding the Blight as the Archdemons once did? 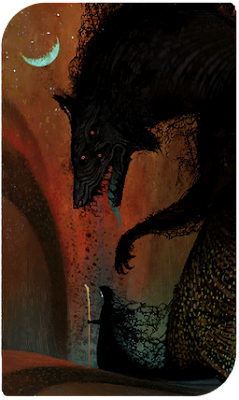 Note: Several smart people on Twitter have been positing that this Wolf is not THE Wolf, and that, in fact, the representations of the Dread Wolf on frescoes across the games has actually been a misdirection in which we are seeing different wolves, perhaps Solas's "pack" of followers (even, Julie Taube suggests, some of the Forgotten Ones). I think this a pretty amazing idea, and I absolutely agree that this could be the case. 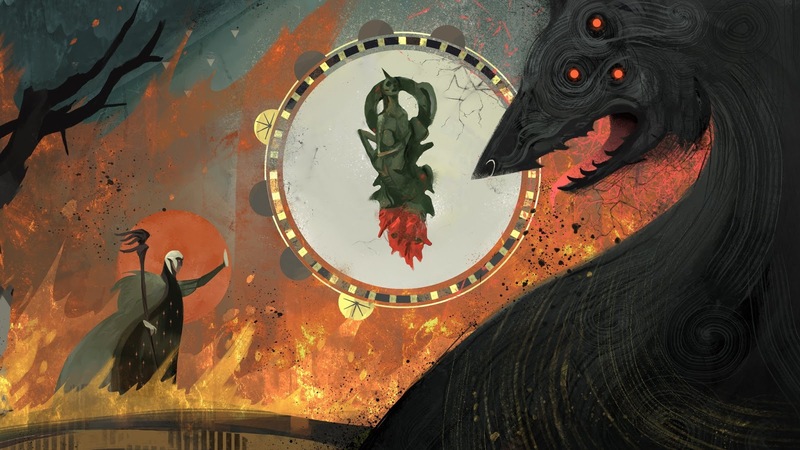 But the thing that trips me up, as here, is the consistent presentation of the Pride Demon Eyes in all the Dread Wolves we've seen (save for the fluffy, almost coy White Wolf on Solas's Hierophant/Fool romanced Tarot card). 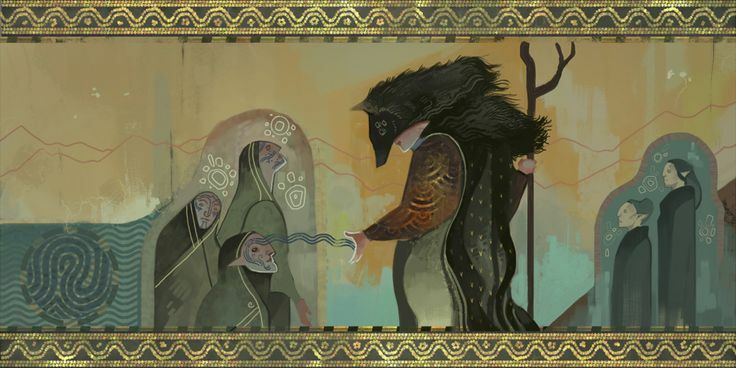 For me this heralds the Wolves (and this one), on an intimate and personal level, as representations of Solas ("Pride") himself. But I could, as always, be so, so wrong. Meanwhile, there's something else interesting about both presentations of the Wolf here: It appears to be the only source of the red lyrium energy in the image. 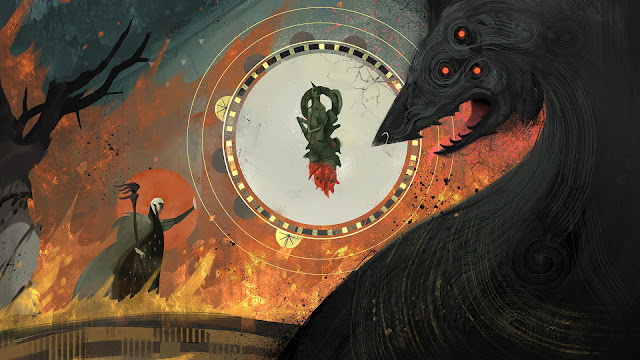 If we look closely, there are almost electric arcs and crackles of red energy around the Dread Wolf's head, extending up above the Idol Circle, and especially all around the Dread Wolf's head and mouth. And yet there are no cracks of red upon the Dread Wolf himself. Just that lolling red tongue (which was a distinctive greenish-blue in the Tower Tarot previously—scroll down to the end of this post for a refresher look). Is he the source of the Red Lyrium or corruption? Or is this simply another representation of Fade energy? So it appears that the Wolf exudes two things at once: darkness (Blight?) and redness (corruption, lyrium, the Fade). Also, note the fact that in the flat artistic rendition of the fresco, just above the wolf's head and down into the area behind his jaw, we can see a fine network of cracks in the fresco, the only place they occur this deeply (except possibly also below the Wolf's jaw as well). Those cracks are notably missing from the final teaser video image. Either way, all things considered, whether it was tame before, the Wolf now appears to be pretty clearly an element of chaos, corruption and destruction. And is that now what Solas himself has become? The destroyer of all worlds? Or... their savior? 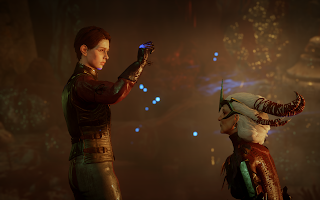 Those of us who have played "Trespasser" (in my case, sniffling my way through the final enjoyably heartbreaking moments with the help of wine, tissues and cookies) know that the Inquisitor lost the Mark and her left forearm when Solas took both in a magical (and evidently painless) amputation to save her life. 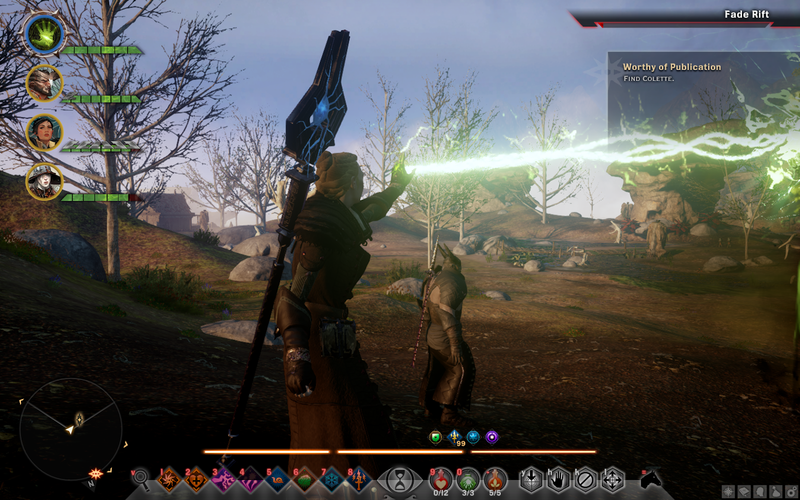 So, Solas now has the Mark. And it may not just be something he possesses as a boost in power, but as something he can potentially wield. Because isn't it interesting, then, that Solas in this mural stands in a pose we saw dozens of times before from the Inquisitor as she closed Rift after Rift? I don't think it's an accident. He stands before the closed circles of the Idol, before the Dread Wolf, and all he has is an upraised hand. We don't see any spell emanating. It's almost as if he's confronting it through will alone. Meanwhile, along these same lines, is the Wolf even a wolf anymore? It now appears to be more of an elemental being, a swirl of arching darkness. 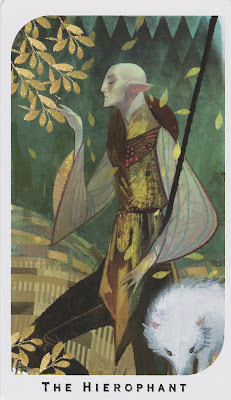 Where are its paws, for instance, which were so visible in the Tower Tarot (and with that lifted paw ironically echoing the romanced Solas's upraised hand from the previous card)? I know I'm probably overanalyzing. But I also think these are good questions if we're going to solve this. 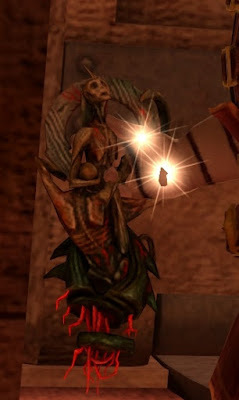 One of the popular fan theories out there that I could never quite get behind was the idea that the Old Gods/Archdemons were literally also the Evanuris in some way. And I could never make that work. But in our recent Twitch discussion (after shrieking over the new teaser), Stefanie White, Brian Bauer, and Jason Nosja posited that when the Veil came down, it divided Solas in some way just as it divided the world itself, freeing perhaps his Dread Wolf side in ways that would not otherwise have occurred. I immediately loved this idea, and think there's something there. First off, even if it's not something that happens all the time, it takes the presentation of the wolf as an entity alongside Solas into the real world (or Fade) as something beyond metaphor. But for me, more importantly, it solves the riddle of the Old Gods/Evanuris. If the Veil sliced down like a knife even as Solas imprisoned the spirits of the Evanuris in a kind of Fade Prison, their dragon-selves (the "divine shape" reserved for the gods alone) could have been created at the same time, similarly imprisoned and slumbering beneath the earth. The deaths of these sentient beings I believe did not kill the corresponding spirit selves of the Evanuris, but they did mean the loss of part of the soul of the Evanuris, an ancient connection Flemeth/Mythal was fairly desperate to save whenever she could (and it's worth noting that for all her calls for vengeance, she seems to genuinely want to protect the Old God Baby, and shows nothing but subtle love and empathy for Kieran when she meets him). 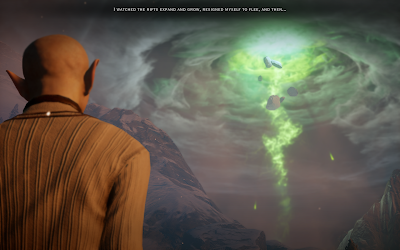 This also explains Solas's deep hatred for the Grey Wardens, as to him what they are doing is both fumbling, dangerous, uninformed, and crude. To Solas, if the archdemons are physical remnants of the divine (however corrupted), the idea that people now drink their Blighted blood in order to hunt them down, with their own souls destroyed in the act of killing the Archdemon, is understandably foul to him on multiple levels. It even satisfyingly ties in, for me, most of the main religions across Thedas—from the ancient elves, to the ancient worshippers in Tevinter, to the Chantry. Anyway, all of this is to preface my idea that we may be seeing a ravaged world dealing with not one but two Blights, as I noted in my last blog post on this. 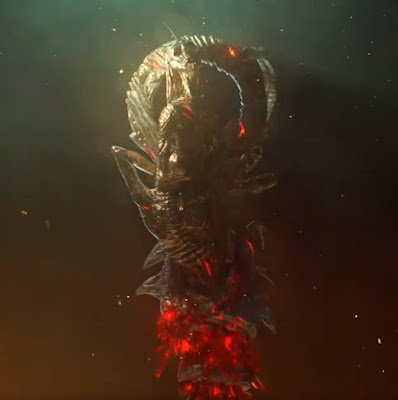 Since the Fall of the Magisters Sidereal and/or the awakening of Dumat, each Blight throughout history in Thedas has begun with the awakening of an Archdemon, or Old God. We know there are two Blights remaining, and two Archdemons hidden beneath the earth. We also know five have been destroyed: Dumat, Zazikel, Toth, Andoral, and Urthemiel. All of this makes total sense to me if in fact, by tearing down the Veil, Solas frees the Evanuris, two of which join with their previously divided physical selves, the two remaining Archdemonic dragons, creating two Blights at once. Add in the potential chaos if the Veil is torn down, PLUS the potential madness as Tevinter and the Qunari attempt world conquest once again (I think it's inevitable), even if simply as an attempt to stabilize what's left of Thedas? This is pretty interesting stuff. And even if the Veil doesn't come down, it's absolutely possible that one or all of the Evanuris (or the Blighted Forgotten Ones!) 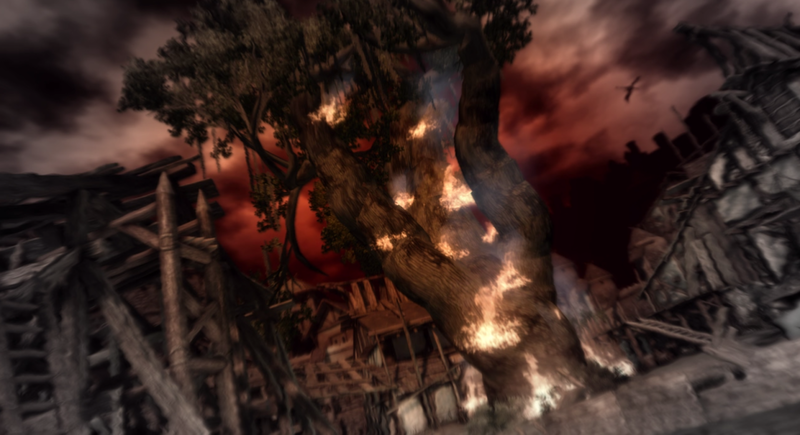 escapes in a different way, wreaking Blight and corruption and holy fire across Thedas in any number of other ways. If this happens, my bet for the major players in fiery vengeance are going to absolutely be Andruil and Falon'Din, alongside perhaps Dirthamen and Elgar'nan. I mean, we see their symbols and statues (hawks, owls, ravens, suns) over and over again in all three games—their mosaics, their altars, their holy places. It's also interesting to note the use of gold leaf here and on the frescoes in general. It seems to almost exclusively gild the images of foci (which, by the way, have eight lines, not seven, as I noted last time—I goofed! ), the borders of the frescoes, the mosaics in the Temples, and (possibly, here) the flames on the bridge. The use of gold leaf to 'burnish' art also reportedly dates back millennia to the Pharaohs of Egypt, where it was "the color of the gods," and it was also popular in China, and later on, in Italy, Greece and Europe. Halos, meanwhile, were used not just for religious figures, but to depict heroes and commanders as well. What were the Evanuris? Heroes. Commanders. Then Gods. And what is burnished in gold here? The borders of the Fade (Circle). And the two images of the still-living 'divine' foci. I believe upon further examination of the teaser and the fresco, that there are two kinds of flames in the image: actual flames (again, perhaps the burning of the "raw chaos"), and then, much higher than Solas, the flame-colored essence of the Fade. It's fun to use this image of Cole's Tarot for comparison here—there's a definite general similarity. It's even more interesting for me to ponder this because my canon choice for Cole is for him to become "More Spirit," so that he returns to the Fade, knowing (even beyond Solas's mindwipes) that he will be needed in the future, and he must return to "help." And I so hope he can! Solas isn't just sad or weary when he speaks those final words. He is in physical distress, possibly agony. If you listen very closely to the teaser, just as the music crescendoes then falls, you can actually hear Solas gasping for breath behind the music. It's very subtle but it's there. It culminates in a great indrawn gasping breath just before he says, "So." As others have already noted, it doesn't end there. 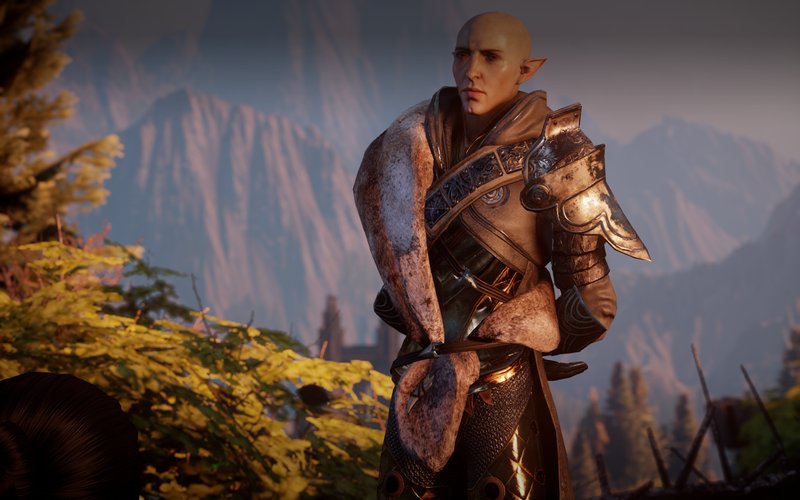 Solas's voice is ever so slightly warped, lower, slower. Still beautiful (of course) but perhaps corrupted? Is it red lyrium after all? Or simple exhaustion and despair at last, after so much life, hubris, and struggle? I still have questions. So, so many questions. 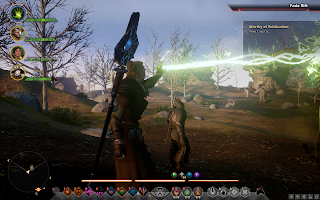 Meanwhile, here's a brief (highly dorky) intro to me and my blog, and a tribute on "What Dragon Age Means to Me," in honor of "Dragon Age Day 2018." Thanks to the best fandom in this world or Thedas!